I feel tremendously honored and humbled to have been named “Cat of the Year” for 2009 by the American Society for the Prevention of Cruelty to Animals (ASPCA). My personal assitants, Burnell and Betsy, will be accepting the award on my behalf at an upcoming luncheon at the Pierre Hotel in New York City. If I have inspired even one person to adopt a shelter cat like myself, than all those hours at the piano have, indeed, been worth it. And while not all cats can play the piano, we all need a loving and safe home. Congrats, Nora!! You are so talented!! And your owners have great taste in choosing u at the shelter. Well, u didn’t inspire me to get a shelter cat now, because my current boy is strictly a loner. However, u *did* inspire me to take piano lessons! Again. 😉 Have a great year, you really deserve the honour! That’s WONDERFUL Nora! I’m so happy for you and your dedi”cat”ed assistants Burnell and Betsy. You are a shining ambassador for shelter cats worldwide and long may you play! Congratulations, Nora, well-deserved!! My own formerly feral SuzieCharmingGirl and I have delighted in such repeated listenings of your cat-alog, that now when I begin playing one of your videos, she will come along from where ever she may be lazing to cozy into the space between me and the warm computer, occasionally tapping her paw on your image. Thanks for bringing us great joy. We look forward to your next concert moment. Congratulations Nora! You are a wonderful representative for shelter kitties everywhere! Keep up the ebony and ivory tangents composing melodies! Nora you an an inspiration to so many. We are so very proud of you and all you have accomplished. Congratulations! Well deserved. Congratulations to you from Shadow,my 7 month old rescued kitten, who thoroughly enjoyed your videos,and my 29 other rescued cats! We’re down here in southern Mississippi, in the midst of tropical storm Ida, web-surfing, and found you, Nora. Can’t wait til the morning to see if Shadow shows any interest in my piano! He kept tapping at your precious face on the computer screen, and started purring! We watched your video on YouTube and think you are fantastic. 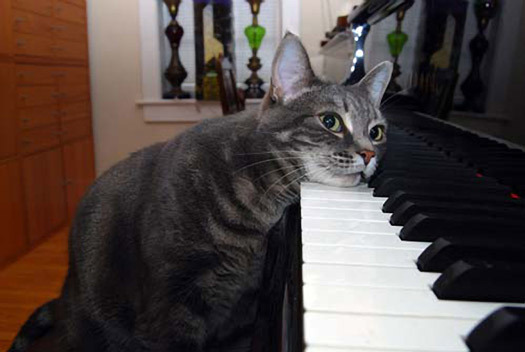 We have never played the piano but we are cats that blog! Congratulations on your wonderful award. Hello from France and many congratulations on your well deserved award. At our home we have a piano and seven cats but not one of them has a talent to match yours. However, we love them all very, very much. They don’t always get on purrfectly and our Parsley likes to scream before Toby touches her – just like you, Nora! Most of our cats are tabby and Willow is grey so your photos look very much like her. The Catcerto is fantastic. We are all looking forward to your next video. My cat Pixie loves when i play the piano for her, but she wont play herself. May God richly bless you and your family.